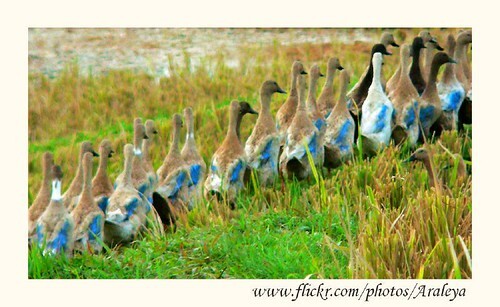 Blue Ducks Marching, originally uploaded by Araleya. Its not so sharp because I took this shot from the running motorcycle. In order not to miss the herons site and terrace paddy field, I parked my bicycle, went to local grocery, ordered some drink and asked for someone who will drive me motorcycle. The man stopped playing badminton and drove me. He used to work in travel agency so he could take me to where I wanted and explained me well, and stopped or slow down motorcycle for me to take photo..